Honda has announced that it plans to stop production at its plant in Swindon for the months of April and May, because of a collapse in global sales. The carmaker had already announced in November the plant would be shut during February and March. This represents the longest continuous halt in production at any UK car plant. Honda said that there were no plans for redundancies and that it intended to "safeguard employment" for those workers who wanted to stay. Workers at the plant will get full pay until the end of March. Although negotiations are not yet complete, workers are likely to receive about 65% of their pay for the remaining two months of the shutdown, the company said. 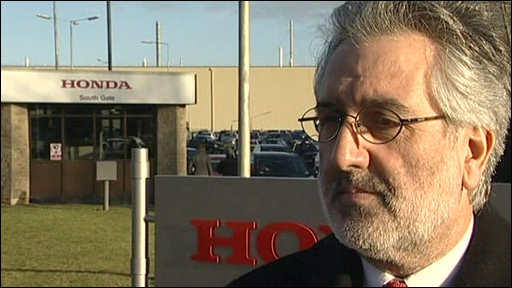 They will also owe the time back to Honda when the plant reopens. "Our members are stunned and worried about what happens next," said local Unite union officer Jim D'Avila. "The European car market is not showing any signs of recovery yet and therefore, we have to reduce our production output further," said David Hodgetts, director of Honda UK Manufacturing. "We will continue to take prompt and flexible counter-measures to ensure that we can meet these challenges with this severe market situation," he added. Bentley, Vauxhall and Jaguar Land Rover have all halted production or cut the working week in order to combat falling demand for their cars. Derek Simpson, joint leader of Unite, said the car industry "desperately needs to see some form of lifeline being thrown to the sector from the government". EU business ministers are meeting in Brussels on Friday to discuss ways to help carmakers through the economic downturn. Ahead of the meeting, the EU's Industry Commissioner Guenter Verheugen warned the outlook for the European car industry was "brutal" and predicted not all European manufacturers would survive the crisis. After the meeting, he said the EU did not intend to relax competition rules on state aid and warned against any "races to subsidies". But he did not rule out increasing loans to carmakers from the European Investment Bank. 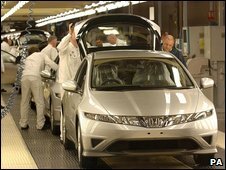 Honda employs 4,200 people in the UK and exports the Civic to 60 countries worldwide. Honda announced earlier on Friday that it would cut 3,100 temporary jobs in Japan and reduce domestic production by 56,000 vehicles, to combat a dramatic slump in global car sales. Rivals Toyota and Nissan have also announced production cuts this week.